Just over 240 PreK-3rd grade Students participated in the service-learning project Tate's Giving Project. After learning about empathy for humans and pets, they first completed the lesson Pet Care and Safety. Students brainstormed what pets need to be healthy and safe and why it’s important for their human companions to provide this for them. 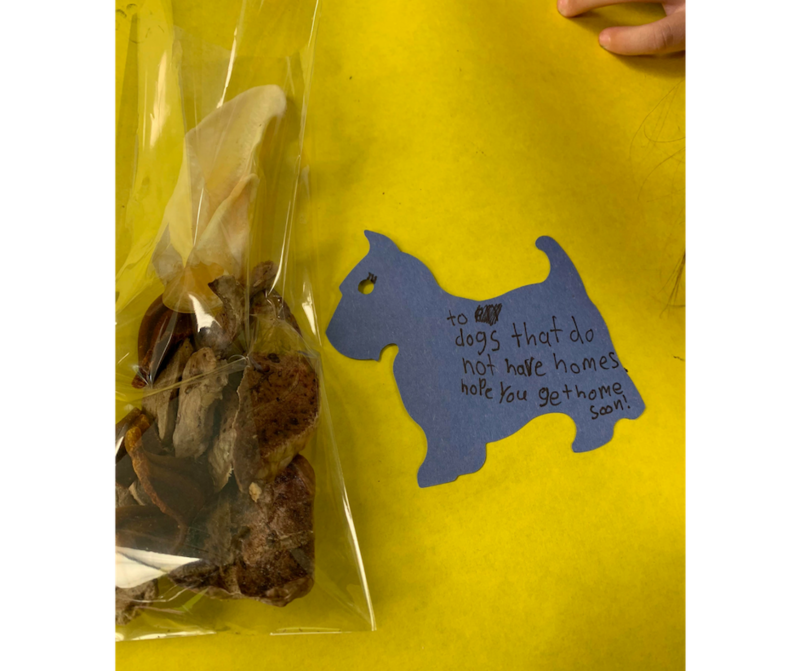 After learning that not all animals are safe and have loving homes, students learned what a local organization, the Dog Patch, is doing to help. Students made the connection easily; the things they have at home could make a huge impact in the life of a homeless pet. After students learned of their mission to help homeless pets, they quickly got to work making flyers detailing what donations could be collected for the Dog Patch. Learning to Give's grant money allowed the students to make an even bigger impact for the Dog Patch, enabling funds to purchase special treats for the homeless pets. One student said, “I can’t believe there are so many dogs that don’t have food and a place to sleep.” Another said, “I hope the dog who gets these treats gets a home.” Students wrote hundreds of similar notes to adoptable pets attaching each to treat bags all the while sharing how different their pets at home were treated and the responsibility humans have to care for pets. “Our school is in its last year of existence as we are combining with another elementary school in town,” said Ms. Dahleen. “We hope to bring our yearly Tate’s Giving Project along with us so that upper grade level students can also feel the warmth, excitement, and pride that our students felt when they presented their donations to the Dog Patch.